Lock in a great price for Hotel Jadran – rated 8.3 by recent guests! 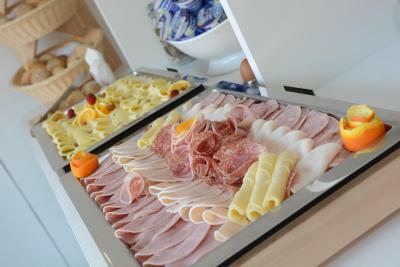 The staff was excellent .Location was near the main square and was great pleasure for me to be in this hotel. For sure I come again here. The bed was good, front desk staff were very friendly and helpful. Location is very central - everything is a short walk away and tram stop is nearby. Firstly and most importantly, the front desk staff. Especially Peter Maras. He made a very good impression of the hotel. Very helpful and extremely polite. The room are very clean, kudos to the cleaning staff. Breakfast was excellent though we were limited with our vegetarian diet. Good location. Clean, comfortable, lovely breakfast. Few minutes walk to the city center. This is not my first time staying with them. They always have been friendly, room were clean and location is excellent. I am coming back for sure. Everything. People at the hotel are great! We are back to Zagreb in the next few months and are planning to stay there again. Convenience, access to public transit. Flexible check-in, helpful staff, offered us a quiet room off the main street as requested. Friendly, helpful staff. The rooms are clean and functional. My room was at the back and so no problem with any noise. The hotel is simple but comfortable, and the staff are very helpful - offering good and honest advice when I had questions. They also speak foreign languages (eg., other than Croatian) very well. Hotel Jadran This rating is a reflection of how the property compares to the industry standard when it comes to price, facilities and services available. It's based on a self-evaluation by the property. Use this rating to help choose your stay! Located in the very heart of Zagreb, Hotel Jadran offers easy and quick access to all the sights and attractions of the city center. 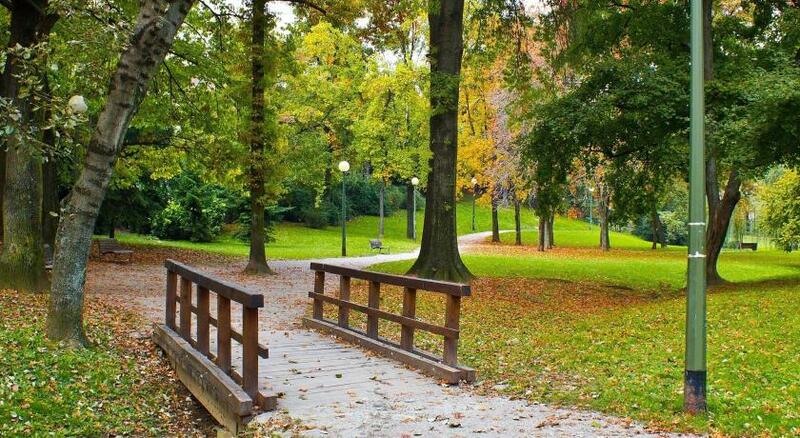 Ban Jelacic Square in Zagreb is a 7-minute walk away. Free WiFi is available. All rooms are air-conditioned and feature a flat-screen TV. A working desk is provided as well. 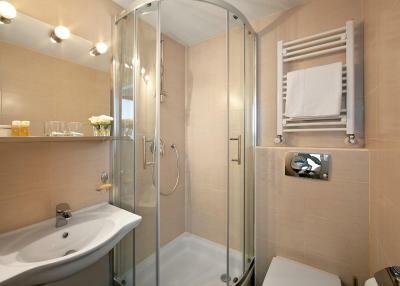 Every unit also consists of a private bathroom with a shower and a hairdryer. A buffet breakfast is served at the property. Guests traveling with pets may request a dog bed, food and water bowls and a floor mat for pets, subject to availability. Just 650 feet from Jadran Hotel there is a public parking garage. 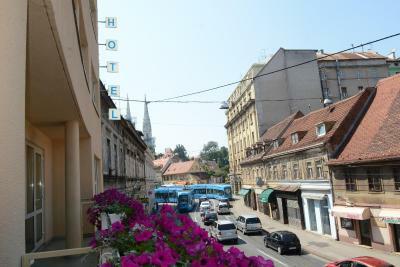 Cvjetni Square is a 10-minute walk from the hotel while Zagreb Cathedral 1,950 feet away. Zagreb Airport is 12 mi from the property. When would you like to stay at Hotel Jadran? 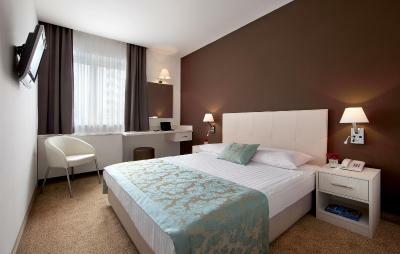 This spacious air-conditioned room features a large double bed, TV and a private bathroom with shower and a hairdryer. This spacious air-conditioned room features a TV and a private bathroom with shower and a hairdryer. Charming small hotel in city centre. House Rules Hotel Jadran takes special requests – add in the next step! Hotel Jadran accepts these cards and reserves the right to temporarily hold an amount prior to arrival. Please note that the hotel only accepts payments in local currency. Guests paying by credit card might notice a difference in room rate due to the differences in currency exchange rates. The breakfast. It could have a little more food variety. They gave me a twin instead of the double that I booked. The coffee maker was really dirty. Location - walkable to attractions. There is a supermarket at the corner. Staff was nice. I paid extra for breakfast which was worth it - eggs ( fried, boiled or scrambled) sausages, pastries, fruits, cereal and cold cuts. More fried eggs they always finished before I got to breakfast!!!!! Rooms at 1st floor are to be avoided because of noise in the breakfast room in the morning. On Sunday evening there was even loud noise of people talking and having a good time around 18h. Too bad they didn't close the door. Their breakfast is great. I initially had decided not to include breakfast, but when i saw what they had, i took it and loved it. good coffee too. My room was nothing like the lovely room in the picture on Booking.com. My room was all painted white - everything was white except the curtains and the runner at the end of the bed! The walls were quite dirty in places. There were attempts to paint over the marks that didn't really work. I wished the room had been better maintained. I'd advise the hotel to repaint the room. It looked like it hadn't been painted in a long time. Maybe pure white is not the best colour! The staff were excellent and always willing to help. The breakfast was simple but tasty - REAL scrambled eggs were appreciated! The location was perfect - only a few minutes walk from the centre of town. The bed was very comfortable. Staff is very friendly! Room extra clean!